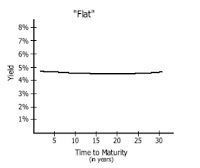 · The graph that plots coupon rates against a range of maturities -- that graph is called the spot curve. · The graph that plots yields against a range of maturities – that graph is called the Yield curve. So, what is the difference between coupon rates and yield rates? - Yield rate is the interest earned by the buyer on the bond purchased, and is expressed as a percentage of the total investment. 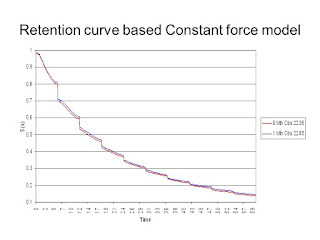 Coupon rate is the amount of interest derived every year, expressed as a percentage of the bond’s face value. Yield rate and coupon rate are directly correlated. The higher the rate of coupon bonds, the higher the yield rate. · Supply and Demand: We all know how the prices influence by the supply and demand factors, same happens in case on interest rates also. If there is more demand of finance in the market, then it will push the interest rates up and if there is little demand of finance, then it will push interest rates down. · Expected Future Inflation: As we know that the return we receive on our investments is not the real return because of inflation. Suppose you earn 8%p.a. and inflation exists in market at 6% p.a. So, in real terms you approximately earned 2% p.a. So, lenders will expect the interest rates they obtain that will cover inflation atleast. So, in the periods of high inflation, interest rates will be high. 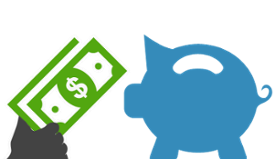 · Tax Rates: Now investors will require a certain level of return after tax. So, if tax rates are high, then the interest rates may also high. · The term structure of interest rates takes three primary shapes. 1.If short-term yields are lower than long-term yields, the curve slopes upwards and the curve is called a positive (or "normal") yield curve. the yield curve is positive, this indicates that investors desire a higher rate of return for taking the increased risk of lending their money for a longer time period. Many economists also believe that a steep positive curve means that investors expect strong future economic growth with higher future inflation and thus higher interest rates. 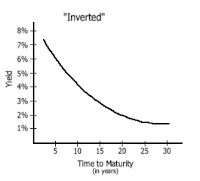 2.If short-term yields are higher than long-term yields, the curve slopes downwards and the curve is called a negative (or "inverted") yield curve. a sharply inverted curve means that investors expect sluggish economic growth with lower future inflation and thus lower interest rates. 3.A flat term structure of interest rates exists when there is little or no variation between short and long-term yield rates. 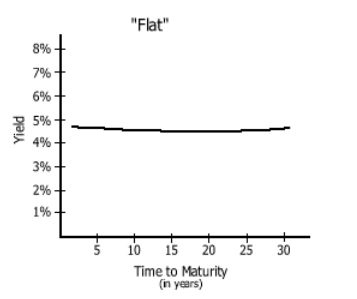 A flat curve generally indicates that investors are unsure about future economic growth and inflation. Note that we also assume flat yield curve in case on Immunisation. 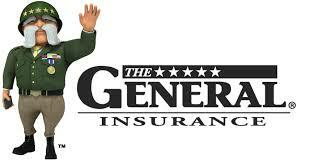 1: Buy $1 of one-year bond (the short bond) and when it matures buy another one-year bond. 2: Buy $1 of two-year bond (the long bond) and hold it. According to the expectations theory, they are perfect substitutes and their expected returns must be equal. Scenario2: An expectation of rise in the interest rates (in near future), will make short term investments more attractive and short-term investments less attractive. So, investors will be more towards short-term bonds and thus demand for short term bonds rises and then price for short-term bonds rises and yields will fall in the short-term investments (due to negative correlation between price of bond and its yield). 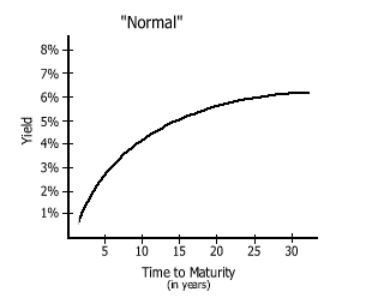 For reference, see Normal yield curve. 3. Market Segmentation: Under this theory, the future shape of the curve is going to be based on where the investors are most comfortable and not where the market expects yields to go in the future. This theory assumes that markets for different-maturity bonds are completely segmented. The interest rate for each bond with a different maturity is then determined by the supply of and demand for the bond with no effects from the expected returns on other bonds with other maturities. In other words, longer bonds that have associated with them inflation and interest rate risks are completely different assets than the shorter bonds. Thus, the bonds of different maturities are not substitutes at all, so the expected returns from a bond of one maturity has no effect on the demand for a bond of another maturity. Because bonds of shorter holding periods have lower inflation and interest rate risks, segmented market theory predicts that yield on longer bonds will generally be higher, which explains why the yield curve is usually upward sloping. Bonds of different terms are attracted to different investors, who will choose assets that are similar in terms of their liabilities. If you have liability to pay after 20 years than you invest in long term bonds (as in case of Pension Funds, where they have start paying pension when person gets age 65 years or whatever the case may be). If you have the liability to pay in near future maybe 6 months than its better to invest in short term bonds (as in case of banks, where investors may withdraw a large proportion of funds at very short notice.